The Edge Center Gallery in Bigfork, MN will exhibit the works of the late Joseph Geshick. "JOSEPH GESHICK: Journeys" will be exhibited from May 31st to June 30th. Many of the works have never been seen in public. Paintings and other items are on loan from individual collectors. Gallery hours: Thursdays through Saturdays from 10 am to 4 pm. For more information call 218-743-6670 or see: www.the-edge-center.org. Edge Center Gallery, 102 2nd Avenue, Bigfork, MN. Bockley Gallery is pleased announce an exhibition of work by Francis Yellow: Takuskanskan "something moving." Gallery Hours: Wednesday through Saturday, Noon to 5 pm. Bockley Gallery, 2123 W 21st Street (west of Lake of the Isles, near Franklin),?Minneapolis. Bockley Gallery will have an exhibition of work by Francis Yellow. Exhibit runs from June 2 through June 30. Gallery Hours: Wednesday through Saturday, Noon to 5 pm. Bockley Gallery, 2123 W 21st Street, Minneapolis. For more info, call 612)-377-4669. "Mni Sota: Reflections of Time and Place" features works by 17 Native American artists from the Minnesota region. Free and open to the public. May 28-June 30, Tweed Museum, Duluth, MN. Minnesota State Arts Board Festival Support grant deadline. Applications are available at www.arts.state.mn.us. Native community members and organizations with questions about the grant can call the MSAB office at 800-866-2787 or they can email the Native American Community Liaison, at: rhiana.yazzie@arts.state.mn.us. Applications must be received by June 8 at 4:30 pm. Information can also be found on the community liaison Facebook page, MN-State-Arts-Board-Community-Liaisons. 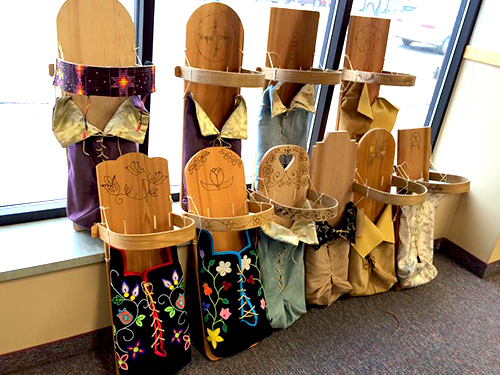 Decorate a shoulder bag while learning about the art and culture of the Ojibwe, a woodland people of the Great Lakes region. The cost for the shoulder bag is $7 and includes supplies needed to decorate the bag, Musuem admission is not included. Please allow an hour to make the craft. Recommended for children ages 6 and up. 11 a.m. to 3 p.m. Fee: $7 for shoulder bag materials (museum admission not included). Mille Lacs Indian Museum and Trading Post, 43411 Oodena Dr., Onamia, MN, 320-532-3632. MAICC 20th Annual Golf Tournament. Enjoy a fun-filled day of networking and camaraderie on this 18 hole championship course. Raffles and goodie bags. All money benefits the MAICC. Registration 10:00 a.m. Shotgun Start at 12:00 p.m. Dinner and Awards at 5:00 p.m. Fees: Individual Golfer: $160.00; Foursomes: $600.00. Held at The Meadows at Mystic Lake, 2400 Mystic Lake Drive, Prior Lake, Minnesota. 952-233-5533, www.mysticlakegolf.com. Hotel Reservations: Mystic Lake Casino Hotel. Rooms available Wednesday and Thursday evenings, June 13th &14th, $79.00 per night. Call for reservations and mention MAICC Golf Packages 952-445-9000. For more info and registration form, see: www.maicc.org or contact Jacie Poitra at 612-877-2117 or: jpoitra@maicc.org. Artist in Residence at the Mille Lacs Indian Museum & Trading Post. Guests that visit during the Artist in Residence Program will be able to learn how American Indian arts and crafts are made; techniques and materials used, as well as give visitors an appreciation of the use of natural resources taken from the environment of the woodlands of Northern Minnesota. This is a free event. 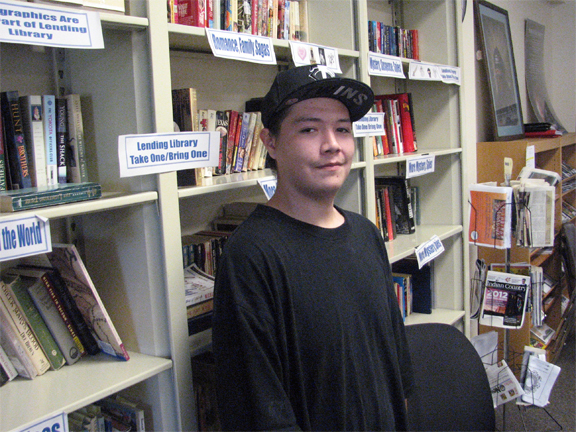 Josef Reiter (Ojibwe) is a jewelry maker and he will be at the Trading Post from 11 am to 4 pm. For more informatiom, call the Mille Lacs Indian Museum at 320-532-3632 or send an e-mail to: millelacs@mnhs.org. Birch Bark Basket Workshop – Come and learn how to store and work with birchbark in this one day workshop from 10 am to 4 pm. Participants will be making a basket to take home. Registration is required by June 20. A light lunch and refreshments will be provided. A minimum of 5 participants required to host workshop. Children under 18 must be accompanied by an adult. For more informatiom, call the Mille Lacs Indian Museum at 320-532-3632 or send an e-mail to: millelacs@mnhs.org. The Native Arts and Cultures Foundation application deadline for its 2013 Artist Fellowships is June 21. Awards will be $20,000 and will be made in six disciplines: Visual Arts, Filmmaking, Music, Dance, Literature, and Traditional Arts. Artists must demonstrate excellence, having made a significant impact in their discipline, earned respect from their colleagues, and achieved recognition in the field. Work must be evolving and current. Native artists are defined as American Indian from federally recognized U.S. tribes, Alaska Native or Native Hawaiian. All applicants must apply online at www.nacf.us/user/register. Contact Tom Roque for questions: reuben@nativeartsandcultures.org or 360-718-7057. All are invited and welcome to attend the Language Camp at the Kiwenz Campground in Sawyer, MN on the Fond du Lac Ojibwe Res. Campers can set up their area on June 20 (Bring own camping gear, utensils, and chairs). Security will be provided and new to the campsite area are bathrooms and shower facilities. The camp will include hands-on cultural learning and traditional arts activities that people of all ages can participate in. At each station, there will be a fluent Ojibwe speaker and a translator. They will also be on hand throughout the camp to help teach the language. On that Saturday, there will be some fun events including a Canoe Race followed by a Canoe Race using only a Ricing Pole and Knockers. Cash prizes to the top four placement winners. There will also be a section of the camp called "Ojibwe Only Zone" where people can listen or hold conversations in Ojibwemowin only. Cheat sheets will be provided. Other cultural activities include: Canoe Races, Moccasin Game, Nature walk identifying Ojibwemowin names for plants, Family games like Ojibwe Jenga and Cribbage, Ojibwemowin Fun Time with the children, Mad Science Experiments, Music and Entertainment. If you have any questions contact Jim or Pat Northrup at 218-878-0245 or Rick Gresczyk at 952-215-1973. The camp is free and open to the public! Everyone is welcome regardless of proficiency in Ojibwe Language. The National Johnson-O’Malley Association’s Art Contest. The theme is "JOM an Everlasting Educational Gift". This contest is open to all. Artwork must be no larger than 81/2 x 11". The artist should include an interpretation of their artwork. Don’t include any text in the artwork. Please include your name, age and address with your artwork so than we can contact the winning entries! Mail of deliver artwork to: Navajo Nation JOM Program, P.O. Box 1950, Window Rock, AZ 86515. All entries must be received by June 22. The winners will receive cash prizes. 1st Place $300, 2nd Place $200, Honorable $100. For more information, contact: Clayton Long at 435-678-1251, clong@sanjuanschools.org; or Eleanor Thomas at 928-871-7461, eleanorgthomas@yahoo.com. Minnesota State Arts Board Arts Learning grant deadline. Applications are available at: www.arts.state.mn.us. Native community members and organizations with questions about the grant can call the MSAB office at 800 866-2787 or email: rhiana.yazzie@arts.state.mn.us. Applications must be received by June 22 at 4:30pm. Information can also be found on the community liaison Facebook page, MN-State-Arts-Board-Community-Liaisons. Join us for the 2012 berry Camp, founded and in honor of Earl and Kathy Hoagland. Sponsored by Sah-kah-tay. Free for the entire family!! Food provided! We are asking Each participate to bring silverware, oneplate and/or a bowl. June 28: arrival day for campers after 4 pm, feast in the evening. June 29 – 30: 2 full day of activities – Arts and crafts moccasin game, Jam and jellies youth activities, Ojibwemowin and more. July 1: departure day – Breakfast, giveaway, travel song. This program is designed for the entire family to enjoy, gather and meet new people! What to bring:?tent, sleeping bag, chairs, bug spray, flash light. Contact information: Tamie at 218-936-5319 or 218-902-0191. Location: little elbow lake on State Hwy 113. Elbow Lake, White Earth Reservation, East off Hwy 59 to little elbow 15.7 miles. West off hwy 71 to little elbow 23.5 miles. Just south of Nay tah waush. Minnesota State Arts Board Artist Initiative grant for Literary Arts, Poetry, and Prose deadline. Applications are available at: www.arts.state.mn.us. Native community members with questions about the grant can call the MSAB office at 800-866-2787 or email: rhiana.yazzie@arts.state.mn.us. Applications must be received by June 29 at 4:30 pm. Guests that visit during the Artist in Residence Program will be able to learn how American Indian arts and crafts are made; and techniques and materials used. Cynthia Holmes (Ojibwe) makes jewelry and wall hangings and she will be at the Trading Post from 11 am to 4 pm. Free. For info, call the Mille Lacs Indian Museum at 320-532-3632 or e-mail: millelacs@mnhs.org.